Ever since I was a kid, I have been a whole-hearted peanut butter fan. I love the stuff and will eat it on just about anything. But as I have gotten older, I have grown very fond of almond butter. It is now my nut butter of choice. Don't tell the peanuts. And I am certainly not the only one. For so many reasons, people are eschewing the pb for the ab. Especially those who have peanut allergies. Which is exactly who I made these cookies for. So many of my friends kids have peanut allergies now, I feel horrible that that can't enjoy one of my favorite childhood cookies: the peanut butter blossom. Instead I made almond butter blossoms. And guess what. They are amazing! I haven't done much baking with almond butter, but it works perfectly as a substitute for peanut butter and adds it's own amazing yet subtle flavor. HOW TO MAKE THEM Get out your flour, sugar, butter, eggs, and all those basic cookie ingredients. You will also need almond butter and honey. Yes, honey! I subtituted some of the sugar for honey which added an extra flavor that perfectly compliments the almond butter. If you don't have any honey, just use plain old granulated sugar. First, cream together the butter, brown sugar, granulated sugar, and honey. Then mix in the almond butter. Make sure it is good and mixed in before adding in the egg. Now it's time to add the egg and vanilla. If you really want to ramp up the almond flavor, add 1/4 tsp almond extract. A little goes a long way, friends. Once the egg is mixed in, but not overly mixed, add in the flour, baking soda, and baking powder. If you are using unsalted almond butter, add a pinch of salt. Mix until it forms a stick but firm dough. Use a spoon or a small cookie scoop to form the dough into small 1 - 1 1/2 inch sized balls. Roll the balls in between the palms of your hands to form a smooth ball. Roll the ball in some sugar. I like to use turbinado sugar because it's nice and coarse. But if you don't happen to have that on hand (I wouldn't expect you to), just roll it around in some granulated sugar. Place the balls about 2 inches apart on a baking sheet and then pop in the oven to bake for 10 minutes, or so, until they are just barely golden brown on the bottom. While the cookies are in the oven start unwrapping whatever chocolate you plan to use for you cookies. Since Valentine's Day is right around the coner, I use these Dove Chocolate Hearts. But you could, of course, use Hersey Kisses or any of your other favorite chocolates. As soon as the cookies come out of the oven they will be nice and puffy and a little cracked on top. Immediately press your unwrapped chocolate into the center of the cookie so that the cookie puffs up around the chocolate. While there is nothing better than a cookie straight out of the oven, I would encourage you to wait to dig in, or serve, these cookies until they have cooled. The chocolate will start to melt from the hot cookie, so once the cookie cools the chocolate will start to come back to it's original state. Then it's ready to eat! Even after they have cooled, the cookies are super soft but have a little crunch on the outside thanks to that sugar. The almond butter and honey flavors are subtle but wonderful! These cookies are perfect for just about anyone, regardless of their love for almond butter. 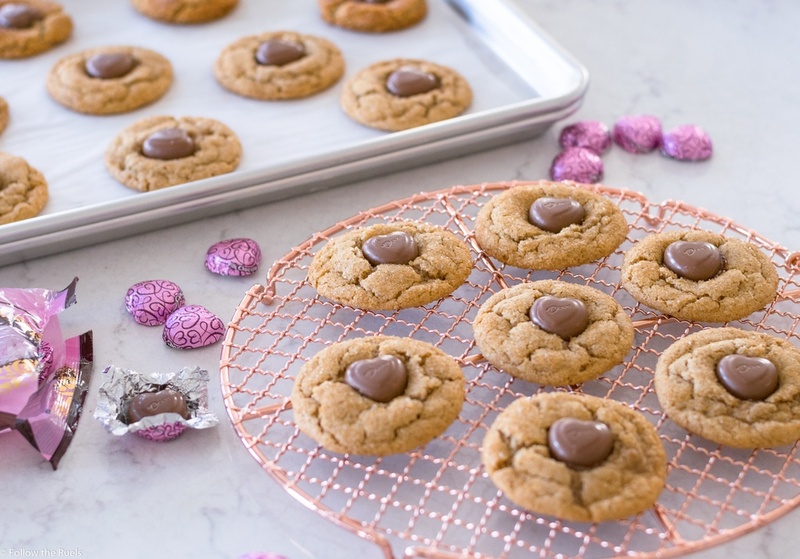 Even those who are loyal to peanut butter will love these cookies! Preheat oven to 350 degrees. In a large bowl, cream together butter, sugars, and honey until fluffy and creamy. Mix in the almond butter until completely smooth. Add in the egg and vanilla an mix until just combined. Add in the flour, baking soda, and baking powder and mix until a sticky but thick dough forms. Use a spoon or cookie scoop to form 1 to 1 1/2 inch balls. Roll between your palms to form a smooth ball. Add the extra granulated sugar or turbinado sugar to a small bowl. Roll the ball of dough in the sugar. Place on a baking sheet about 2 inches apart. Bake for 10 minutes, or until just barely golden brown on the bottom. Immediately remove from the oven and press an unwrapped chocolate candy in the center. Let the cookies cool to room temperature before serving.